I want to tell you about a woman living in Marietta, Ga., named Donna Rowe . . . In Vietnam Donna was a nurse captain in charge of the triage unit of the Third Field Hospital near Saigon, the capital city of South Vietnam. While these hospitals dealt with a flood of casualties, Donna and her team earned this remarkable record – they never lost a patient in triage during her 12-month tour. 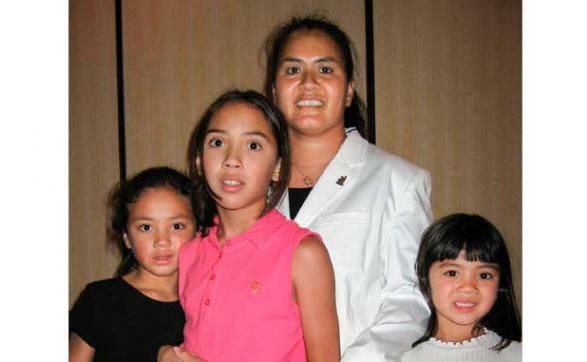 They might have died before arriving on the helicopter, they might have died after going to surgery or later from complications, but while in the care of triage, Donna and her team moved heaven and earth to keep them alive, and never lost a single one. The false narrative of our troops as demons in Vietnam bothers Donna a lot, and she tells a story to illustrate the opposite is true. In a book I wrote about Vietnam vets, the chapter titled “Just One Life” is about Donna and this story. One day Donna had a radio request from a Dustoff (medevac helicopter) pilot named David Alderson. He said he had a severely wounded civilian baby on board and wanted permission to land on the hospital pad. Donna had never heard his call sign before, which told her he had been passed on by other hospitals further away who had told him no. The hospital priorities were: (1) U.S. armed forces, (2) U.S. civilians, (3) Allied forces, (4) host country military forces and lastly, (5) Vietnamese civilians. They had been struggling to keep up with the stream of combat casualties, and had several Dustoffs on the way with more wounded. But since it was a baby, and what she had learned from her parents about standing up for the right thing, Donna said yes and knew she would take some heat. She didn’t know that in the mountains near Cambodia, American troops from the 1st Infantry Division came upon a Montagnard village that had been completely annihilated by the enemy. Montagnards are a small, dark, peaceful people who live in mountain villages, persecuted for centuries by the Vietnamese and Cambodians. Montagnards, or “Yards,” were an ally, their small but very tough men frequently working with our troops and Special Ops units, applying their unique jungle skills to stop an invading enemy. And so our unprincipled enemy slaughtered the civilian villagers, even the elderly and children. Amidst a pile of bodies our troops heard the weak whimpering cries of a baby. They dug through the pile of dead to find a baby girl, still barely alive, clutched tight in the arms of her dead mother. The mother’s body was in rigor, they couldn’t move her arms, and so they called for a Dustoff and carried the baby and her dead mother, and loaded them onto the helicopter, which received enemy fire despite the big red cross on all sides. At the hospital landing pad, they had to break the arms of the dead mother to extract the baby, dehydrated and malnourished with fragmentation wounds in her abdomen and lower chest, causing her abdomen to fill with blood and hampering her little body’s ability to breathe. So Father Sullivan used water from the sink to sprinkle on her tiny little head and said, “I baptize thee … ” When he stopped for a name, Donna scrambled in her head and said, “Name her Kathleen Fields!” Kathleen was from the Irish ballad her dad sang to her and Fields was from the 3rd Field Hospital. Father Sullivan’s hand touched her little forehead while he stated the baptismal rites then he looked around this fast moving gurney and said “… and your godparents are Specialist Medic Darrell Warren (a Mormon), Specialist Richard Hock (a Catholic), and Captain Donna Rowe (a Methodist).” They became godparents on that day, joining with a Catholic priest to do a tiny bit of God’s work, all while rushing the baby to life-saving surgery. Kathleen lived, and became the secret darling of the hospital since keeping a baby broke rules, but the staff stole time to feed her, make clothes and a bed for her, and the big boss gave Donna an approving wink. To shorten the story, an American soldier wanted to adopt Kathleen and take her back to America. 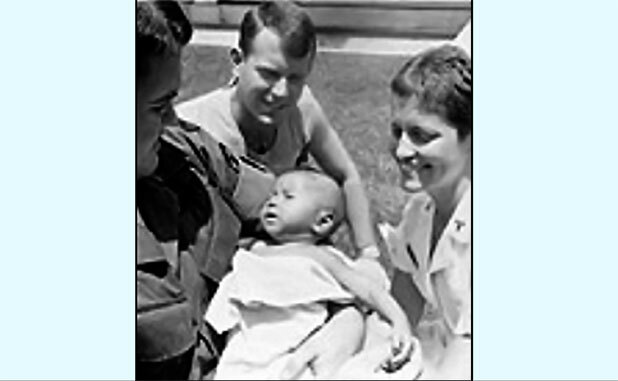 Much red tape was cut through, and even the President of South Vietnam had to sign off, but she was adopted and did go to America. For Donna, 33 years passed before she told this story to Bill Osinski, a reporter for the Atlanta Journal Constitution. You could have knocked her over with a feather when that newspaper story ultimately led to a phone call saying Kathleen had been found in California. I’ll let you imagine the thrills when Donna and the other godparents were reunited with Kathleen and met her husband and three children. Below, ‘Baby’ Kathleen and 3 of her 4 children. Photo/Submitted. 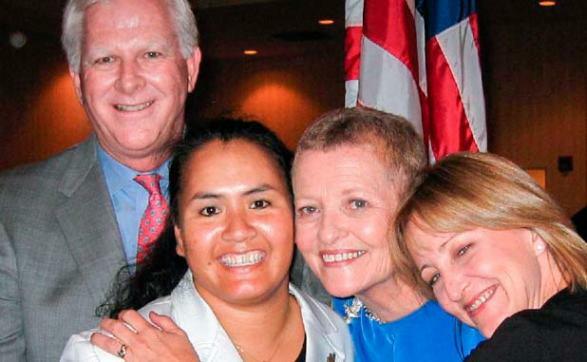 Below, ‘Baby’ Kathleen (center, in white) and Donna Rowe (in blue) being hugged by Kathleen’s adoptive parents. Photo/Submitted. 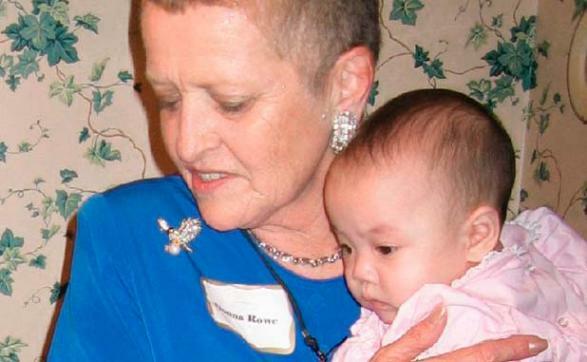 Below, Donna Rowe holds Kathleen’s newest baby. Photo/Submitted.